Oral epithelial lesions are precursors in the development of oral squamous cell carcinoma (OSCC), which is believed to arise from a series of stepwise genetic changes induced by carcinogens. During the process of carcinogenesis, it is proposed that principal etiological factors cause DNA mutations, activating oncogenes interfering with tumor-suppressor genes. Shin et al., Hsieh et al., Levrero et al., Abrahao et al. Tumor suppressor genes are normal genes that control the cell cycle. They slow-down cell division, repair DNA damage, and regulate apoptosis. Tumor suppressor genes play a critical role in regulating when cells are allowed to divide and increase in number. When DNA damage is detected in a cell, tumor suppressor genes stop the cell from multiplying until the damage is repaired. Furthermore, specific tumor suppressor genes can stimulate cells with damaged DNA to commit “cell suicide”. When the function of tumor suppressor genes is impeded by carcinogens, cells with damaged DNA continue to divide. These cells accumulate further DNA damage that can eventually lead to the transformation of a normal cell to a dysplastic cell. The p53 gene is a tumor suppressor gene and is the most frequent site of genetic alterations found in human cancers. Experimental studies have shown that mutant p53 or p53-/-mice are very prone to both spontaneous and induced tumors. The p53 protein is a sequence-specific transcription factor that regulates the expression of genes involved in cell cycle arrest or apoptosis in response to genotoxic damage or cell stress. The tumor suppressor p53 is critically important in cellular damage response and is the founding member of the family of proteins, i.e., p63 and p73. All three genes regulate cell cycle and apoptosis after DNA damage. However, despite a remarkable structural and functional similarity among p53, p63, and p73, mouse knockout studies have revealed an unexpected functional diversity among them. Choi et al., Melino et al. p63 and p73 though members of the same family are primarily involved in development, differentiation, and damage response. Thus, p53 family proteins take on functions within a wide biological spectrum stretching from development (p63 and p73), DNA damage response via apoptosis and cell cycle arrest (p53, p63, and p73), chemosensitivity of tumors (p53 and p73), and immortalization and oncogenesis (p73). An alteration in the expression of these proteins either solely or in association with each other may be responsible for the progression of leukoplakia from epithelial dysplasia to carcinoma. Chen et al. Extensive electronic review does not reveal studies performed to explore the different isoforms, i. e., p63, and p73 genes along with the ancestral prototype, i.e., p53 together in epithelial precursor lesions. Although many studies have been performed regarding the expression of p53, p63, and p73 independently. With this background in sight the present study was designed to evaluate the expression pattern of p53, p63, and p73 in different grades of epithelial dysplasia through immunohistochemical (IHC). The present study was carried out in the Department of Oral and Maxillofacial Pathology and Microbiology, Sharad Pawar Dental College and Hospital, Sawangi (M), Wardha, after approval from the Institutional Ethical Committee, Datta Meghe Institute of Medical Sciences, Sawangi (M), Wardha, Maharashtra. The study included 30 histopathologically diagnosed cases of epithelial dysplasia from the archives of the Department of Oral Pathology, Sharad Pawar Dental College, Sawangi (Meghe), Wardha and 10 samples of noninflamed normal buccal mucosa served as control. The diagnosis of degree of dysplasia was graded with reference to the following criteria: mild ectodermal dysplasia (ED), dysplastic alterations confined to the lower third of the buccal epithelium; moderate ED, dysplastic changes observed for up to two-thirds of the thickness of the buccal epithelium; and severe dysplasia, more than two-thirds but less than the whole thickness of the buccal epithelium contains the dysplastic cells. Chen et al. 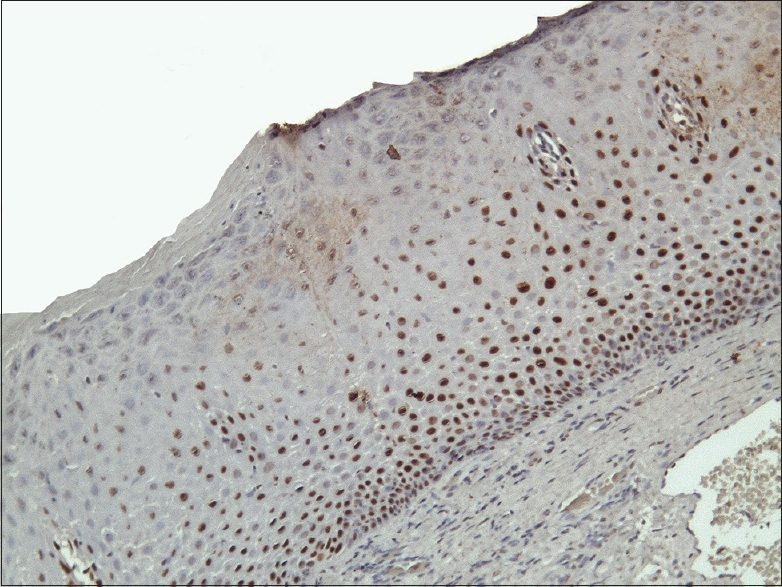 IHC staining was carried out on paraffin-embedded tissue using monoclonal mouse anti-human antibody against p53, p63 and rabbit polyclonal antibody against p73. Samples were divided into four groups as per [Table 1]. The sections were examined for the presence of a colored end product at the site of the target antigen (DAB chromogen brown end product). Tissue sections positive for p53, p63, and p73 were examined for the presence of brown stained nucleus and evaluated by locating the epithelial linings most heavily labeled by scanning the sections at a × 10 magnification. Cell counts were made at × 40 magnification with Leica DMLB2 research microscope with Leica Q-win standard software (Switzerland) in five randomly selected fields. Cells were considered positive for p53, p63, and p73 which showed nuclear staining. The stained nucleus was scored positive regardless of the intensity of staining. Cells that lacked a clear staining were excluded. Minimum of 1000 cells were counted in each section. p53, p63, and p73 labeled cell counting were done among all groups. The number of positively stained nuclei was expressed as a percentage of the total number counted for individual layer and in complete epithelium. This was evaluated and traced by using the computer-aided analysis system Leica Q-Win ProV3.5.0, Leica Microsystems (Switzerland) Ltd.
Statistical analysis was carried out in the present study to assess the correlation and comparison of the expression of various antibodies among various groups and to find the significant difference between those values. The tests employed were descriptive statistical analysis, Mann–Whitney U-test, Kruskal–Wallis test, Pearson's Correlation Coefficient analysis. Statistical significance was set at P < 0.05. All statistical analysis was performed using SPSS 17.0 version (SPSS Inc., 233 South Wacker Drive, 11th Floor, Chicago, IL 60606-6412). The IHC results of p53, p63, and p73 in potentially malignant disorders are summarized in [Table 2]. The results have been presented in two sections with detailed analysis of p53, p63, and p73 expression in individual groups as descriptive statistics and their statistically significant differences in the groups [Table 1], [Table 2], [Table 3], [Table 4], [Table 5], [Table 6]. 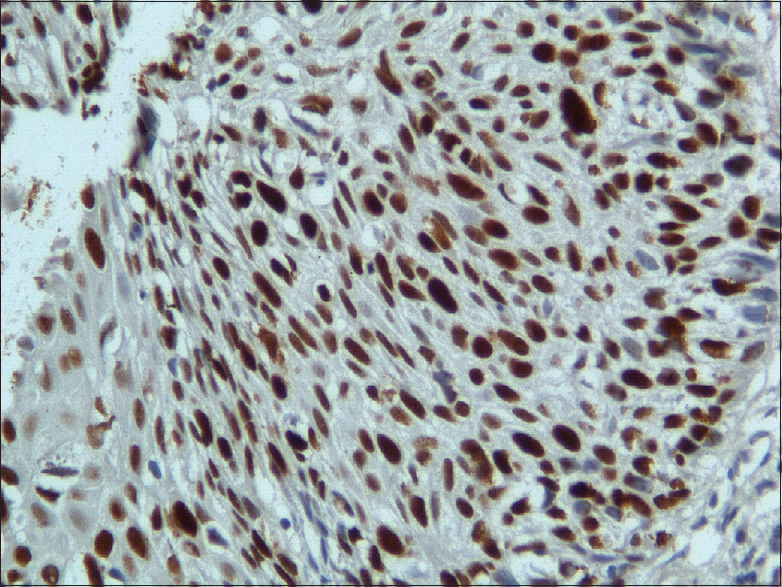 Positive p53 and p63 staining was a common finding in all study groups. The number of cells positive for p63 protein immunoexpression was higher than that for p53. The degree of staining of p53 and p63 increased from mild-to-moderate-to-severe epithelial dysplasia. The expression of p73 was observed to be variable in each grade of dysplasia. In mild epithelial dysplasia, the expression of p53 was found to be restricted to a few cells of the basal layer (6/10 cases), whereas p63 was found to be intensely and discreetly expressed in the basal and suprabasal layers (10/10 cases). 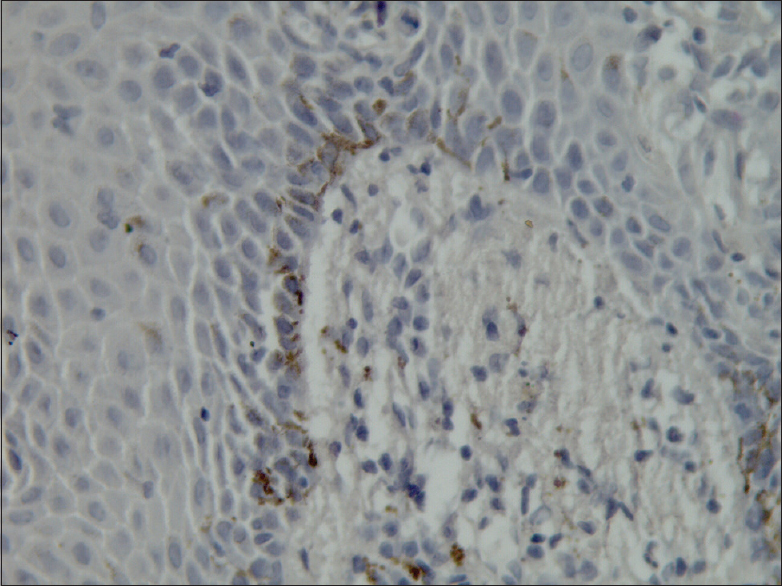 p73 expression was variable in the mild dysplastic epithelium. 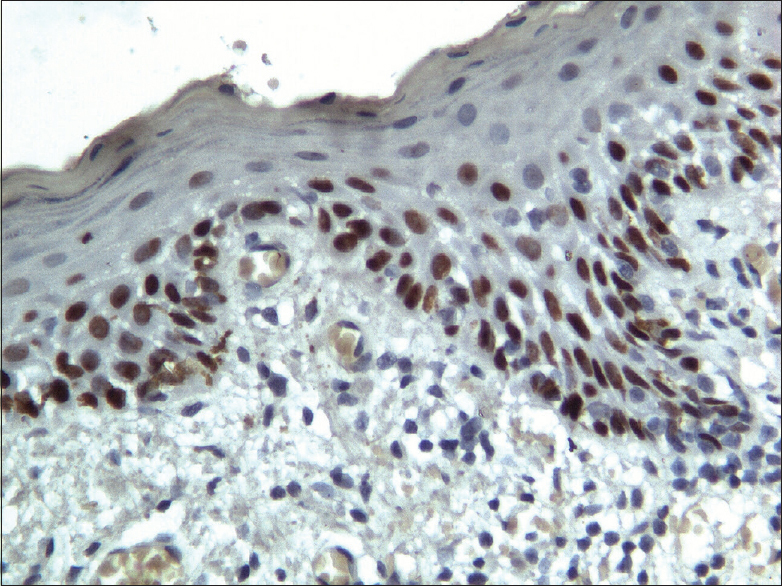 In moderate epithelial dysplasia, immunostaining of p53 was positive in all the cells of basal and suprabasal layers (4/10 cases). The expression of p63 was intense and discreet in all the dysplastic cells (9/10). 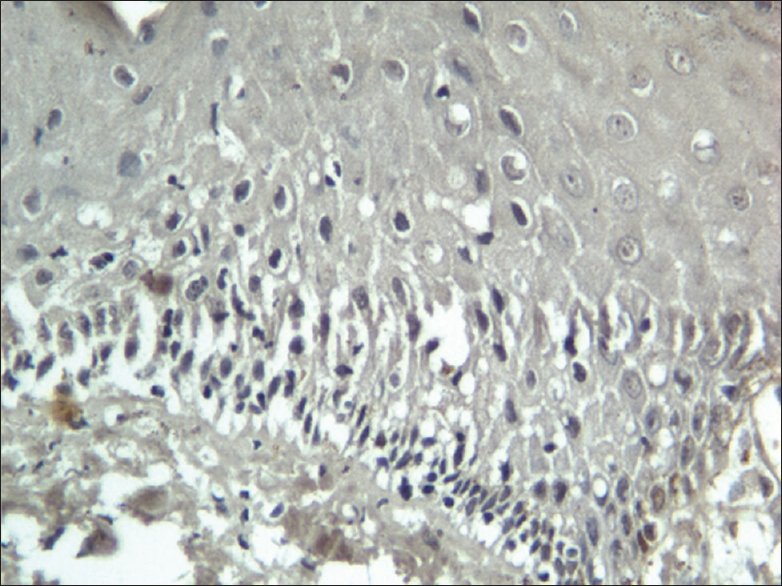 p73 expression was variable in the moderately dysplastic epithelium. 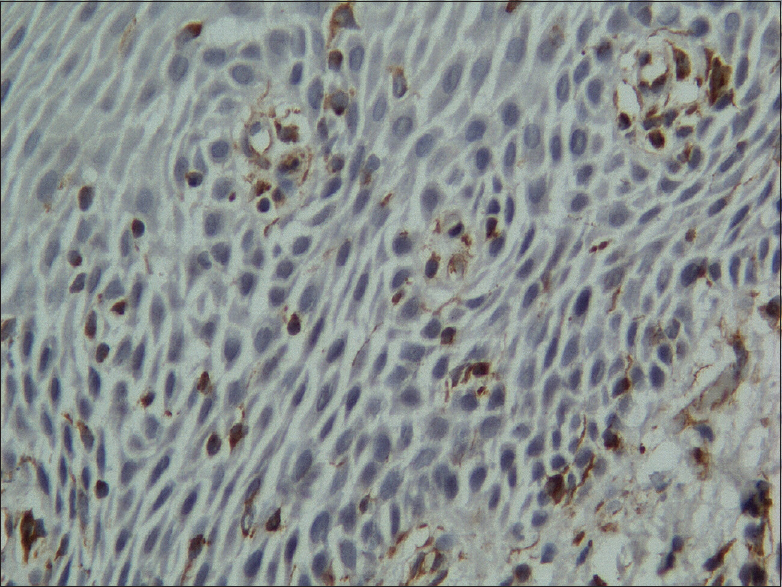 In severe epithelial dysplasia, immunostaining of p53 was positive throughout the epithelium (6/10 cases). 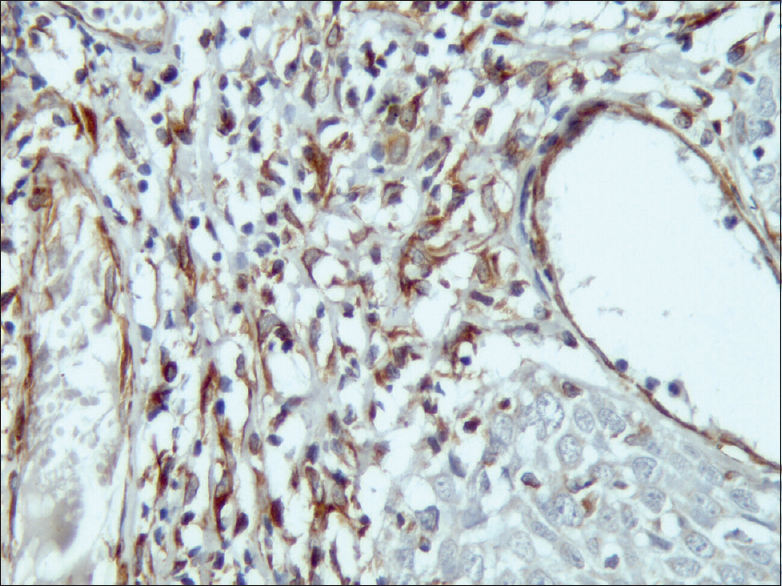 The expression of p63 was positive throughout the epithelium (9/10 cases). 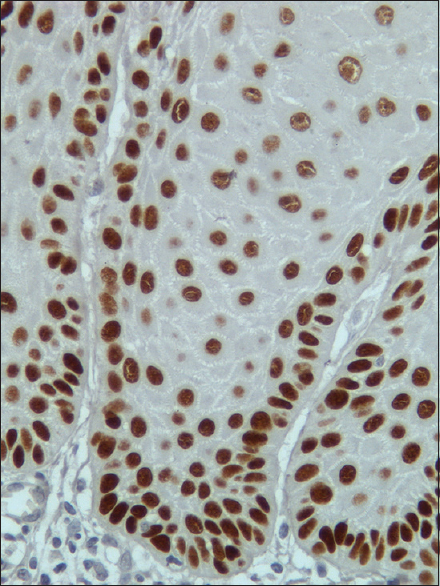 p73 expression was variable in the severely dysplastic epithelium. 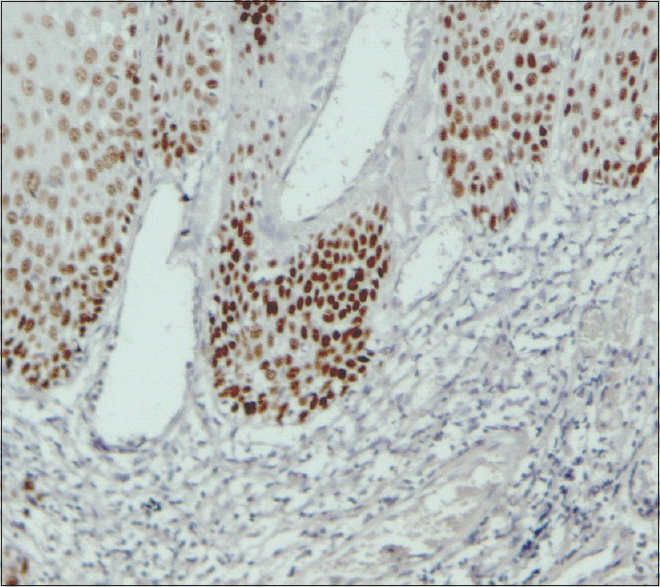 The degree of expression of p53 was seen in very few basal cells of normal epithelium (5/10). p63 expression was more and seen in many cells of the basal and para basal layer. The expression of p73 was more in the superficial layers and was found to be scanty and variable in the basal cell layer. A significant difference in positivity was observed with p53 and p63 among all the grades of dysplasia. Positivity of expression of p73 was observed to be nonsignificant among all grades of dysplasia and in normal tissue. 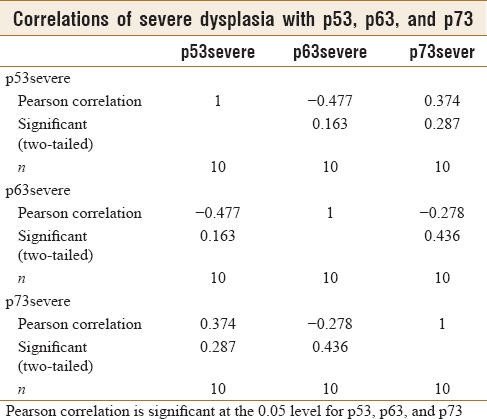 Correlations:-Significant positive correlation was noted between p63 and p53 in mild dysplasia [Figure 1], [Figure 2], [Figure 3], [Figure 4], [Figure 5], [Figure 6], [Figure 7], [Figure 8], [Figure 9], [Figure 10], [Figure 11], [Figure 12]. It is widely accepted that OSCC develops as a result of the accumulation of genetic errors in the same tissue Kim et al., Joseph Choi and Myers and one of the most common genetic damage that is noted is mutations in p53 and its homologs which leads to loss of function. Hollstein et al., Chow et al., Greenblatt et al. Often, OSCC is preceded by Epithelial dysplasia which is most commonly presented and diagnosed with leukoplakia and various reports indicate that a large percentage of epithelial dysplasia transforms into OSCC. However, difficulties are often encountered in histopathological diagnosis of severe epithelial dysplasia and carcinoma in situ (CIS). In recent years, IHC studies using various markers in precancerous lesions of oral cavity have been reported. 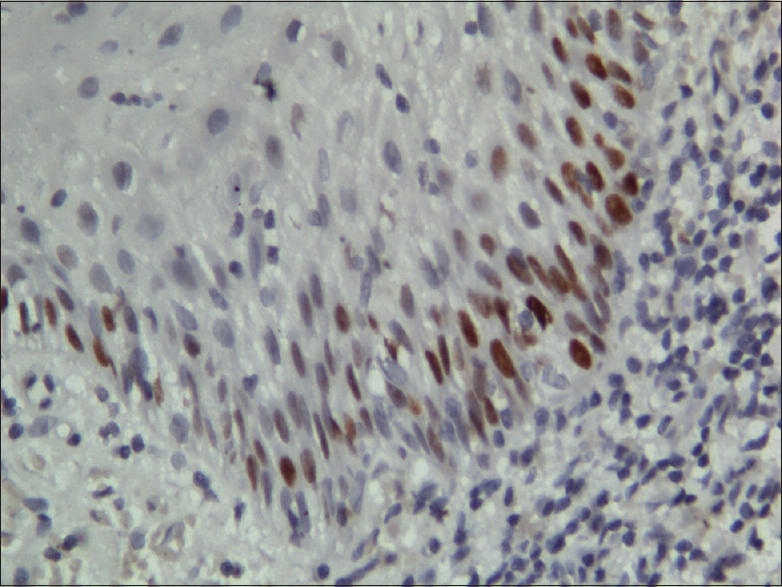 However, the application of a combination of several IHC stains to diagnosis is rarely reported. Okada and Moride Montebugnoli et al. As the sensitivity and specificity of a single marker in the progression of dysplasia to carcinoma has been debated; We evaluated and compared IHC staining of p53, p63, and p73 in hyperkeratosis with mild, moderate, and severe epithelial dysplasia including CIS. p53 gene is a well-recognized tumor suppressor gene that is frequently altered in tumors. Its gene product is a transcriptional factor that regulates the expression of genes involved in cell cycle arrest or apoptosis in response to genomic damage or cell stress. Two p53 homolog genes, p63 and p73, have been identified at loci 3q27–29 and 1p36, respectively. These genes encode multiple proteins that have a significant degree of sequence homology, particularly in the transactivation, DNA-binding, and oligomerization domains. Although these p53 homologs might have a tumor suppressor function, genetic alterations, such as mutation and loss of heterozygosity are less frequent than those associated with p53. In recent studies, up-regulated expression and/or activity of p63 and p73 have been revealed in the transformation of potentially malignant lesions to malignancies. Melino et al., Hu et al. The p63 gene is a member of the p53 transcription factor family and can produce six different proteins from two promoters and the use of differential splicing. The TAp63 isoforms are similar to p53 in transactivation capacity, while the Δ Np63 isoforms act as inhibitors of transcription by occupying DNA binding sites without transactivating. The predominant p63 isoform expressed in normal squamous epithelia and squamous carcinomas including squamous cell carcinoma of the head and neck is Δ Np63α. Gu et al. It has been reported that high p63 expression is associated with a more aggressive phenotype and poor prognosis in OSCC Muzio et al. which is in agreement with the findings of our study which suggested that the expression of p63 increased significantly from mild-to-moderate-to-severe dysplasia. 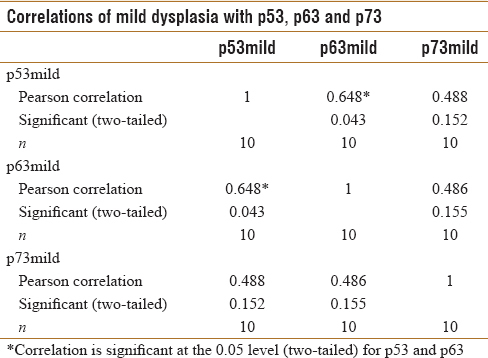 In this study, the expression of p53 in the progression of epithelial dysplasia from mild-to-moderate-to-severe dysplasia did not follow a proportional increase. This can be attributed to the response of the cells to other proliferative signals (inflammation, hypoxia/trauma). An alteration in expression of p53 in potentially malignant lesions indicates that these lesions lacked the protective role of p53 as it may be genetically damaged which is in agreement with Montebugnoli et al. who suggested that the finding of an increased proliferating rate associated to a depressed p53 expression (increased mitotic/apoptosis ratio) in potentially malignant lesions might possibly identify genetically damaged lesions lacking of p53 protective role during cell cycling and may be at risk of progressing to p53-negative cancer. Montebugnoli et al. In a similar study by Murti et al., Nadal et al., nine precancerous lesions became p53-immunoreactive from precancer to cancer, suggesting that p53 overexpression peaks close to the time of transition from precancer to cancer rather than early in the natural history of oral precancer. Murti et al., Shahnavaz et al., Walker et al., Rugge et al., and Coltrera et al. p53 expression was found in a subset of severe dysplasia/CIS not in normal and dysplastic epithelium, which may have prognostic implications. Kaur et al. 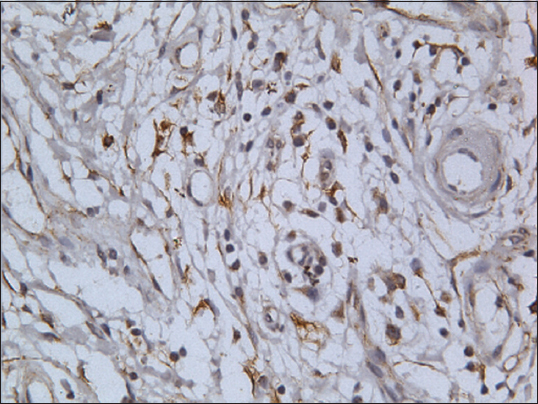 In the present study, the p63 protein has been utilized as a IHC marker of proliferating cells. Montebugnoli et al. The expression of p63 in this study has been found to gradually increase from mild-to-severe dysplasia. The probable mechanism for the upregulation/overexpression of p63 may be stabilization of p63 other than mutations. Stabilization could be further attributed to the disruption of their degradation pathway or accumulation of wild-type of protein due to the rapidity of cell turn over a short interval of time. Overexpression or upregulation signifies increased proliferative potential. This is in accordance with the observations of Pich et al. who suggested that the degree of cellular proliferation within a tumor can estimate or predict its biological aggression. Chen et al., Pich et al., and Haniffa et al. Increase in p63 in dysplasias could be because of expression of Δ Np63. Δ Np63 is transcriptionally inactive form of p63, its overexpression may be associated with suppression of the function of TAp63 which is active the form and causes apoptosis. Δ Np63 isoform acts with bcl2 and inhibitor of apoptosis family members to inhibit apoptosis induction leading to a proliferation of cells. Thus, it could be hypothesized that Δ Np63 isoform might play a role in oncogenesis. Overexpression of p63 may be an early event in head and neck squamous cell carcinomas tumorigenesis. Choi et al., Melino et al. These considerations have stimulated intense research in this area, and many studies have been conducted so far, in an attempt to find out molecular markers that are associated with OSCC and that can predict malignant transformation when found in epithelial precursor lesions, especially in cases without signs of dysplasia. Montebugnoli et al. 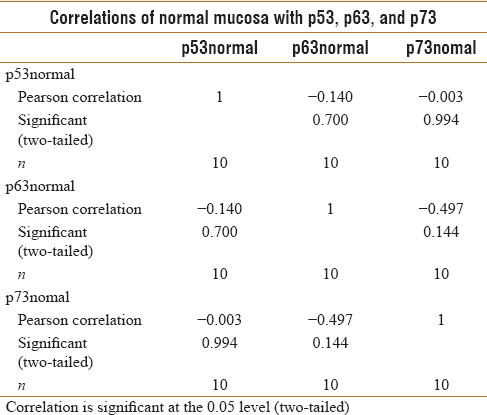 However, p53 over-expression as a marker of progression to OSCC has not been considered highly sensitive, probably because only about 50% of OSCC are associated with over-expression of p53 protein. Montebugnoli et al. The p63 gene expressed transcripts off of two promoters and gave rise to multiple transactivating (TA) and N-truncated, potentially dominant negative (DN) isoforms. This gene structure is also found in p73 such that it too produced both TA and DN isoforms. The significance of these findings is that both these genes not only mimic p53 but also counteract p53 function as well. In addition, the p63 gene was, unlike p73 was not only located within a tumor suppressor locus but also within a region of chromosome 3 that is amplified in many cancers. Frank D. McKeon et al. As a result we would like to conclude that p53 alongwith p63 is a better indicator of the progression of the grade of dysplasia toward malignancy rather than p53/p63 alone. 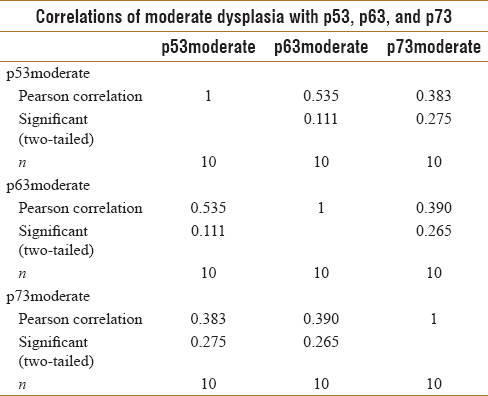 As a result we would like to conclude that p53 alongwith p63 is a better indicator of progression of grade of dysplasia towards malignancy rather than p53/p63 alone. Shin DM, Kim J, Ro JY, Hittelman J, Roth JA, Hong WK, et al. Activation of p53 gene expression in premalignant lesions during head and neck tumorigenesis. Cancer Res 1994;54:321-6. Hsieh LL, Wang PF, Chen IH, Liao CT, Wang HM, Chen MC, et al. Characteristics of mutations in the p53 gene in oral squamous cell carcinoma associated with betel quid chewing and cigarette smoking in Taiwanese. Carcinogenesis 2001;22:1497-503. Levrero M, De Laurenzi V, Costanzo A, Gong J, Wang JY, Melino G, et al. The p53/p63/p73 family of transcription factors: Overlapping and distinct functions. J Cell Sci 2000;113(Pt 10):1661-70. Abrahao AC, Bonelli BV, Nunes FD, Dias EP, Cabral MG. Immunohistochemical expression of p53, p16 and hTERT in oral squamous cell carcinoma and potentially malignant disorders. Braz Oral Res 2011;25:34-41. Choi HR, Batsakis JG, Zhan F, Sturgis E, Luna MA, El-Naggar AK, et al. Differential expression of p53 gene family members p63 and p73 in head and neck squamous tumorigenesis. Hum Pathol 2002;33:158-64. Melino G, Lu X, Gasco M, Crook T, Knight RA. Functional regulation of p73 and p63: Development and cancer. Trends Biochem Sci 2003;28:663-70. Chen YK, Hsue SS, Lin LM. Expression of p63 protein and mRNA in oral epithelial dysplasia. J Oral Pathol Med 2005;34:232-9. Chen YK, Hsue SS, Lin LM. P73 expression for human buccal epithelial dysplasia and squamous cell carcinoma: Does it correlate with nodal status of carcinoma and is there a relationship with malignant change of epithelial dysplasia? Head Neck 2004;26:945-52. Kim J, Shin DM, El-Naggar A, Lee JS, Corrales C, Lippman SM, et al. Chromosome polysomy and histological characteristics in oral premalignant lesions. Cancer Epidemiol Biomarkers Prev 2001;10:319-25. Joseph BK. Oral cancer: Prevention and detection. Med Princ Pract 2002;11 Suppl 1:32-5. Choi S, Myers JN. Molecular pathogenesis of oral squamous cell carcinoma: Implications for therapy. J Dent Res 2008;87:14-32. Chow V, Yuen AP, Lam KY, Ho WK, Wei WI. Prognostic significance of serum p53 protein and p53 antibody in patients with surgical treatment for head and neck squamous cell carcinoma. Head Neck 2001;23:286-91. Okada Y, Moride M. Immunohistochemical study of differential expressions of cytokeratins-13, -14, -17 and p53 in epithelial dysplasia and carcinoma of the tongue. J Hard Tissue Biol 2010;19:123-30. Montebugnoli L, Felicetti L, Gissi DB, Cervellati F, Servidio D, Marchetti C, et al. Predictive role of p53 protein as a single marker or associated to Ki67 antigen in oral carcinogenesis. Open Dent J 2008;2:24-9. Hu H, Xia SH, Li AD, Xu X, Cai Y, Han YL, et al. Elevated expression of p63 protein in human esophageal squamous cell carcinomas. Int J Cancer 2002;102:580-3. Gu X, Coates PJ, Boldrup L, Nylander K. P63 contributes to cell invasion and migration in squamous cell carcinoma of the head and neck. Cancer Lett 2008;263:26-34. Lo Muzio L, Santarelli A, Caltabiano R, Rubini C, Pieramici T, Trevisiol L, et al. P63 overexpression associates with poor prognosis in head and neck squamous cell carcinoma. Hum Pathol 2005;36:187-94. Murti PR, Warnakulasuriya KA, Johnson NW, Bhonsle RB, Gupta PC, Daftary DK, et al. P53 expression in oral precancer as a marker for malignant potential. J Oral Pathol Med 1998;27:191-6. Nadal A, Campo E, Pinto J, Mallofré C, Palacín A, Arias C, et al. 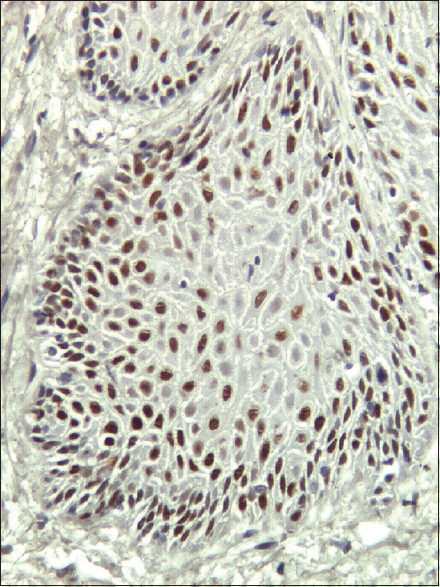 P53 expression in normal, dysplastic, and neoplastic laryngeal epithelium. Absence of a correlation with prognostic factors. J Pathol 1995;175:181-8. Shahnavaz SA, Regezi JA, Bradley G, Dubé ID, Jordan RC. P53 gene mutations in sequential oral epithelial dysplasias and squamous cell carcinomas. J Pathol 2000;190:417-22. Walker C, Robertson LJ, Myskow MW, Pendleton N, Dixon GR. P53 expression in normal and dysplastic bronchial epithelium and in lung carcinomas. Br J Cancer 1994;70:297-303. Rugge M, Shiao YH, Correa P, Baffa R, DiMario F. Immunohistochemical evidence of p53 overexpression in gastric epithelial dysplasia. Cancer Epidemiol Biomarkers Prev 1992;1:551-4. Kaur J, Srivastava A, Ralhan R. Overexpression of p53 protein in betel- and tobacco-related human oral dysplasia and squamous-cell carcinoma in India. Int J Cancer 1994;58:340-5. Pich A, Chiusa L, Navone R. Prognostic relevance of cell proliferation in head and neck tumors. Ann Oncol 2004;15:1319-29. Haniffa AM, Saitoh M, Abiko Y, Takeshima M, Nishimura M, Yamazaki M, et al. Expression pattern of p63 in oral epithelial lesions and submucous fibrosis associated with betel-quid chewing in Sri Lanka. Med Mol Morphol 2007;40:203-7. McKeon FD. P63 and p73 in tumor suppression and promotion. Cancer Res Treat 2004;36:6-12.